Adobe and Microsoft each issued updates to fix critical security vulnerabilities in their software today. Adobe patched its Flash Player software and Adobe AIR. Microsoft issued four updates to address at least 11 unique security flaws, including its final batch of fixes for Office 2003 and for systems powered by Windows XP. Two of the four patches that Microsoft issued come with Redmond’s “critical” rating (its most severe), meaning attackers or malware can exploit the flaws to break into vulnerable systems without any help from users. 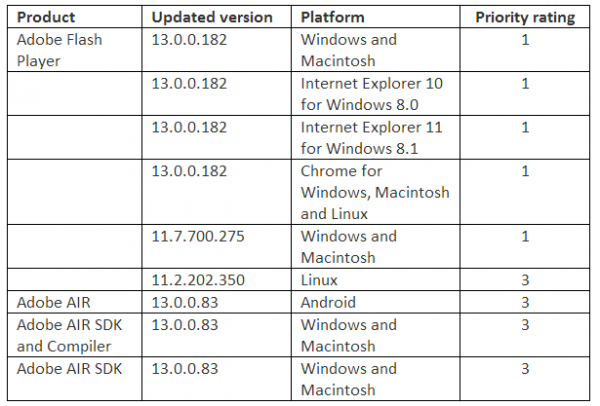 One of the critical patches is a cumulative update for Internet Explorer (MS14-018); the other addresses serious issues with Microsoft Word and Office Web apps (MS14-017), including a fix for a zero-day vulnerability that is already being actively exploited. More information on these and other patches are available here. “From the year that Windows XP was built, cyber attacks have increased in sophistication. Systems receiving regular updates get the protections they need based on the latest cyber threats. But at some point an older model of any product will lack the capability to keep up and becomes antiquated. Obsolescence for Windows XP is just around the corner. Microsoft offers free a Windows XP data transfer tool to ease the hassle of upgrading to a newer version of Windows. I would submit that if your PC runs XP and came with XP installed, that it might be time to upgrade the computer hardware itself in addition to the software. In any case, beyond this month is not the greatest idea, and it’s time for XP users to consider other options. Don’t forget that there are many flavors of Linux that will run quite happily on older hardware. If you’ve been considering the switch for a while, take a few distributions for a spin using one of dozens of flavors of Linux available via Live CD. Adobe fixed at least four vulnerabilities in Flash, all of them critical. The company says it is not aware of any exploits in the wild against the flaws. The latest version is v. 13.0.0.182 for Windows, Mac and Linux systems. The Adobe advisory for the Flash update is here. This link will tell you which version of Flash your browser has installed. 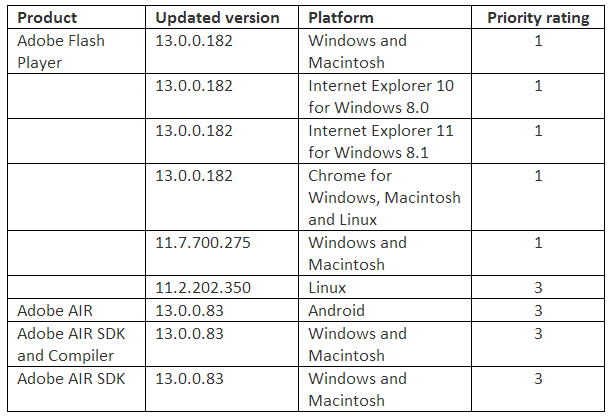 IE10/IE11 for Windows 8.0/8.1 and Chrome should auto-update their versions of Flash. If your version of Flash on Chrome (on either Windows, Mac or Linux) is not yet updated, you may just need to close and restart the browser. The version of Chrome that includes this fix is 34.0.1847.116 for Windows, Mac, and Linux (to learn what version of Chrome you have, click the stacked bars to the right at of the address bar, and select “About Google Chrome” from the drop down menu). If you use Adobe AIR (required by some desktop software products such as Pandora, e.g.,), you’ll need to make sure that’s updated as well. AIR usually does a good job of checking for new versions on startup. If you’re not sure whether you have AIR installed or what version it’s at, see these directions. The latest version is 13.0.0.83, and is available for manual download here. This entry was posted on Tuesday, April 8th, 2014 at 4:43 pm	and is filed under Time to Patch. You can follow any comments to this entry through the RSS 2.0 feed. Both comments and pings are currently closed. A nit I’d like to pick: Windows XP hasn’t reached its 13th birthday yet. I was at the “official” launch event in New York City in Bryant Park, behind the main branch of the New York Public Library in October 2001. Bill Gates spoke; he said he asked then-Mayor Giuliani if it was appropriate to hold such an event so soon after 9/11 and Giuliani urged him not to cancel it, saying that New York City was “open for business.” Sting performed afterwards; when he did the song “If I Ever Lose My Faith In You” (that’s what I remember its title being) he omitted the lyric about never having seen a military solution that didn’t end up as something worse. 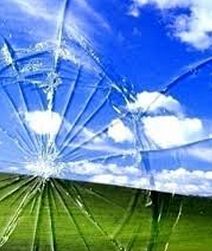 Of course, Windows XP had been released to manufacturing well before that, but not by this day in 2001. I’m curious Brian… At one point it was a parade of Java updates. Now its been like one update in the past 5 months. Have they really fixed java that well or have they just decided to only update java on scheduled basis. Any idea? Java is an Oracle product. The moved to quarterly updates recently. Because we like critical vulnerabilities that are not blocked by Applocker to sit on our machines for 4 months at a time. odd, the Adobe AIR installer says it’s updating from “4.0.0.1390” to 13.0.0.83, on 3 different systems (2x W7 sp1, 1x XP) that had been previously updated independently from the Adobe site with the most recent update (within the last month or so). I noticed that too, but I’m pretty sure the 4.x number is correct (IIRC it was 3.9.x before). My guess is Adobe decided to bump AIR’s version numbers up to the 13.x range, same as Flash (which AIR is somewhat related to). Ever-escalating version numbers seem to be the norm now; see Chrome (now on v34), Firefox (v28) & Opera (v20). Even IE is now on v11 for Win 7 & 8. I see the same Air versioning (4.0.0.1390 to 13.0.0.83) on a Mac that is definetely kept up to date by if nothing else frequent use of Pandora. I likewise am assuming an intention of at least minor version parity with Flash. Easy month for security updates. Goodbye Windows XP even though it will still work without any major problems. I don’t get why everybody is freaking out about all the security issues. It’s Y2K all over again ! Win98 still “works” too, but you’re not going to want to use it for anything other than some nostalgic games/software experience. Anything built in the last 10 years (2002 onward) that’s i686 compatible will run Win7 or some flavor of Linux. For older hardware, pre 2000, there’s a few Linux distros like DSL, Tinycore, Xubuntu, Kwort- just to name a few. Win98 not really even good for that anymore… Dosbox works great for most of the DOS era games and even Win2000 in a VM probably as good or better than XP for the rest. Weird. Sometimes my CMS does that. Not sure why. Thanks. Besides updating to their System Mechanic Pro security product, iolo’s video recommends uninstalling Internet Explorer and Outlook Express. Is that all it takes to keep going with XP, only using the Firefox and Chrome browsers with “Enable phishing and malware protection” ticked on? I never used IE for anything other than Windows Updates anyways… BTW, I thought IE was so deeply embedded into Windows that it couldn’t be removed, or did that change after the EU’s anti-trust lawsuit? I’m not sure, but one thing that would give me pause to this idea is simply this; Microsoft updates are generally labeled with the particular product that the update applies to. In many cases they apply specifically to Internet Explorer, sometimes to Windows media player, but usually they apply to a particular version of Windows. Chrome is a browser, like I.E. It is not an OS like Windows. In other words, it seems likely to me that simply eliminating IE would not be enough and that continued use of XP as your OS would leave you vulnerable. A lot of people are trying to find ways that would allow them to continue using XP. As far as I know, there are none if you use your machine to connect to the Internet. XP has been vulnerably for a long time and Microsoft just keeps plugging the most important holes only till the end of support, that’s why we never saw SP3. That’s odd: I’ve got XP Service Pack 3 running on all of my firewalled XP machines. You may be thinking of XP 64-bit, the red headed stepchild of Microsoft, which only had two service packs since it was really Server 2003 re-packaged as a client OS. I just checked what the latest versions of Flash Player are. (I don’t trust Flash Player itself to let me know when there’s a new version.) There’s now a version 13.0.0.201 for Firefox, Opera and Safari on OS X. You can wait for days, even weeks, for Adobe Flash automatic updates to deliver. Pathetic! yet to display this version number.